Mint Juleps or Margaritas? Join us on CInco de Mayo for some Derby Fun! 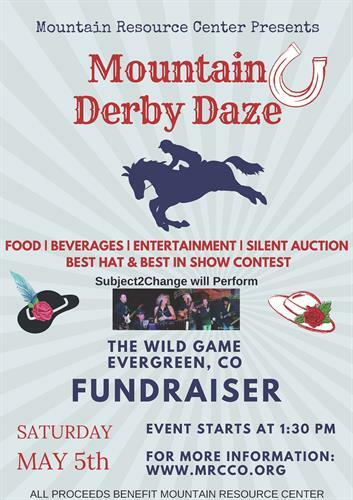 Wear your favorite derby hat and join Mountain Resource Center for this fun, family friendly event with a traditional Kentucky Derby theme! There will be food, dessert, beverages, games, professional photographer Amy Johnson Photography, a whiskey pull, balloon pop, silent auction, prizes for Best Hat and Best in Show, and live broadcast of the Kentucky Derby! Specialty Derby Drinks available ~ Mint Julep & Oaks Lily, as well as beer, well and wine! The Official 144th Kentucky Derby will be shown LIVE on a large screen as well numerous TV’s throughout. Adult Ticket $45 – Includes: Buffet, Dessert, Drink Ticket (beer, wine or well) & Entertainment! Couple $80 – Includes: Buffet, Dessert, 2 Drink Tickets (beer, wine or well) & Entertainment! New this year – V.I.P. tickets! VIP tickets include: 2 adult beverages per person (beer, wine or well), VIP Table and VIP service with your own beverage server & souvenir mint julep glass of the Official 144th Kentucky Derby!